Friends Colin, Ben, and Pat build a bus stop shed from scrap in the Mcdougall-Hunt neighborhood. Colin Wheeler, Ben Ryan, and Pat Jacobson noticed that bus riders waiting for the Mack route 31 bus on the corner of Mack Avenue and Elmwood in front of the old Detroit Police 7th precinct had nothing to shelter them from the elements. The three friends live and work in the area and decided to take matters into their own hands. 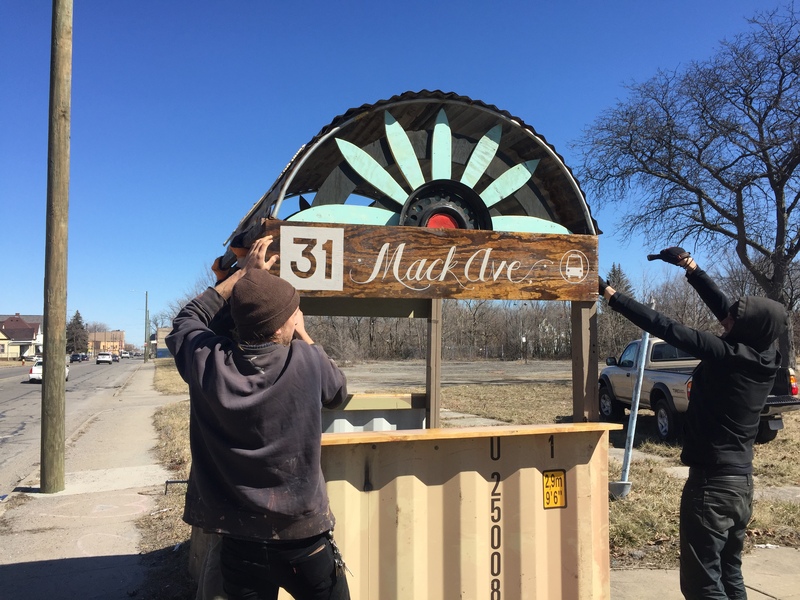 They gathered some scrap materials, which included steel container sides, pieces of wood, and aluminum siding to construct their own bus stop shed. They even topped it off with a sign that reads “31 Mack Ave.” in cursive, equipped with a small bus decal, and a bench to sit down on inside. Their bus stop shed went up March 17 and is still there. On-lookers in their cars waiting for the light to turn green and residents of the Mcdougall-Hunt neighborhood applauded the three friends for their initiative and creativity. The new bus stop shed has an artistic feel to it and cost the builders literally nothing to erect. They do not have plans in the near future to build more but hope that their project inspires others in the neighborhood and in other communities around the city to be the change they want to see. There have been similar bus stop projects in the past by Detroiters, mostly the building of bus stop benches. And in most of those cases, the city has stepped in to put a halt to those projects. Since the sidewalks are city property, citizens must go through the proper steps and authority to place sheds and benches near the bus stops. Jacobson and his friends knew of those consequences before they built their bus stop shed but decided to go ahead with their project.